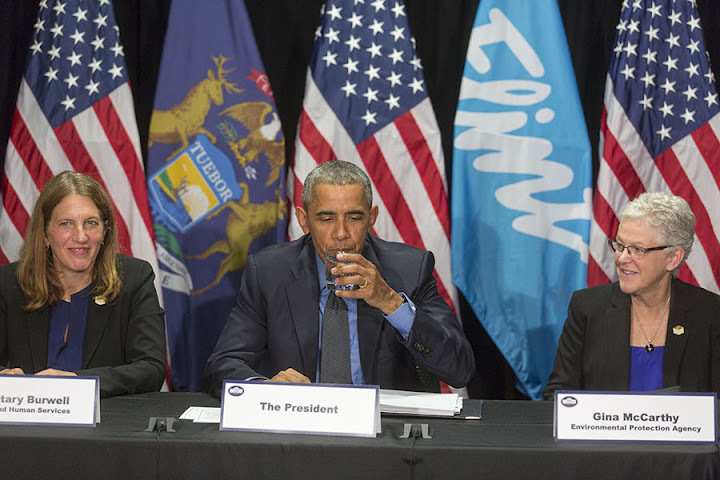 President Barack Obama drank filtered drinking water in Flint water on a visit to the stricken city. After getting a briefing from federal officials on the contaminated water, he vouched for the safety of certified filter and encouraged locals to drink filtered water instead of bottled water. Taking a sip of filtered water, Obama then said "If you"re using a filter ... then Flint water at this point is drinkable." He added that the Environmental Protection Agency says using a filter makes the water safe and drinkable. Before sipping Flint water at a food bank, Obama said "Generally I haven't been doing stunts but here you go." However, he noted that the exceptions to drinking filtered water are pregnant women and children under 6, who should continue to use bottled water "out of an abundance of caution," he said. "This used a filter," Obama said, describing the water, according to the Associated Press. "The water around this table was Flint water and it just confirms what we know scientifically, which is, if you're using a filter, if you're installing it, then Flint water at this point is drinkable." "It might take a year. It might take two years. It might take more," he said. Obama added that replacing lead water service lines in the city will take up to two years or more. The African-American president also urged residents of the predominantly black city to help clean out the water distribution system by turning on their water for five minutes each day. The president also got a 90-minute briefing from Flint Mayor Karen Weaver and Gov. Rick Snyder, both of whom initially greeted him and shook hands after Air Force One landed at Flint Bishop International Airport. After his meeting with the mayor and governor, Obama went to speak to selected members of the community at Flint Northwestern High School. In the gymnasium, Obama gave rousing remarks to the mostly African American audience. Speaking familiarly, he said that he is “listening” and called on Flint residents to reject any stigma that might be attached to children who have consumed Flint’s drinking water and thus exposed to lead. A few scant months before the end of his term, Obama made broad promises to Flint residents who have seen not only the recent water crisis, but decades of economic decline, failed local government, and outmigration. A city that was once a haven for working class Americans transitioning into the middle class has instead become a byword for rusting neglect. "It's not enough just to fix the water," said Obama, who came nearly two years after local residents raised the alarm about discolored and malodorous drinking water and some nine months after a local physician found toxic levels of lead. "I will not rest...until every drop of water that flows to your homes is safe to drink and cook with,” he said. By tribute to volunteer efforts to aid the city, the president said: "Like all our best responses in tough times, this is not a government effort alone." Obama indentified it as a “mindset that believes that less government is the highest good no matter what. It’s a mindset that says environmental rules designed to keep your water clean or your air clean are optional, or not that important, or unnecessarily burden businesses or taxpayers. It’s an ideology that undervalues the common good, says we’re all on our own and what’s in it for me, and how do I do well, but I’m not going to invest in what we need as a community. And, as a consequence, you end up seeing an underinvestment in the things that we all share that make us safe, that make us whole, that give us the ability to pursue our own individual dreams." Committing himself, with but few months left in his administration, Obama "I want all of you to know I am confident that Flint will come back. I will not rest, and I'm going to make sure that the leaders, at every level of government, don’t rest until every drop of water that flows to your homes is safe to drink and safe to cook with, and safe to bathe in—because that's part of the basic responsibilities of a government in the United States of America." Obama alluded to jobs and health initiatives that are coming to Flint, to the applause of the audience. He also repeated a claim often heard from leftist sectors. Obama said, “But I know that here in Flint there are whole neighborhoods that don't even have a supermarket. So we're going to have to figure out how to get supermarkets in those communities.” This was claim was repeated by media covering the event. According to the Detroit Free Press, Arthur McGee of Flint enjoyed the president's speech, but feels the north end of the city is being ignored by local, state and federal officials. The paper reported that McGee referred to that sector of Flint is a “food desert and lacks even more than clean water.” The paper quoted McGee: "We have no grocery stores, no schools. I want to hear someone say that they're going to rebuild that part of the city." This claim had already been repeated in the past by public officials and other media sources. For example, a February report by CNN, for instance, noted that Mayor Weaver said that the stricken city “doesn’t even have a grocery store.” The claims were made while Flint continues to cope with a government-induced water crisis that poisoned the city with drinking water contaminated by toxic lead. Checking the Google maps application, and making several visits to Flint itself, Spero identified several full-line grocery stores in several sectors of the city.